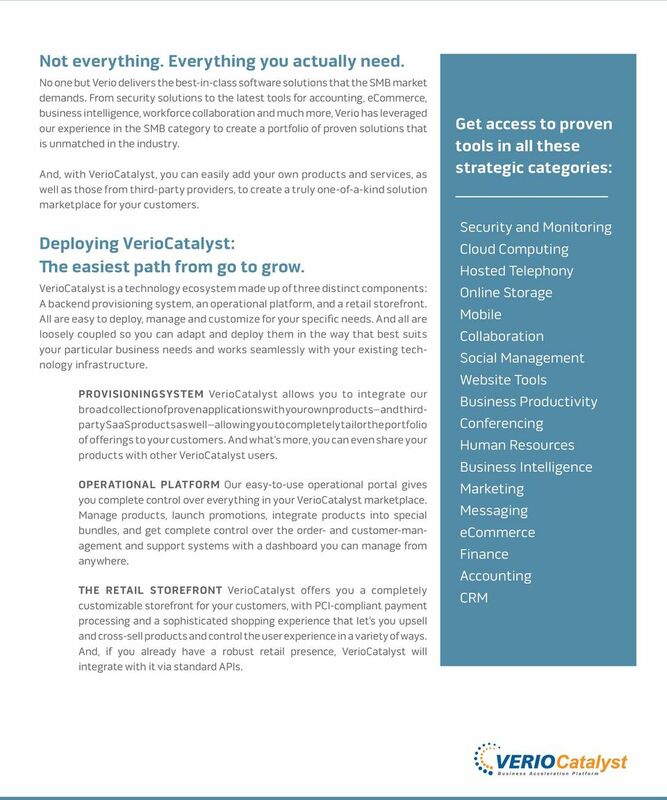 Download "The adoption of cloud-based computing solutions for business"
3 VerioCatalyst is an enterprise-grade Cloud Service Brokerage Platform that helps you deliver integrated solutions to the SMB market in a seamless, scalable and easy-to-customize environment. We offer a collection of best-in-class technology solutions your customers want, with a turnkey platform that can be deployed quickly, in either your environment or ours. It s time to empower your customers in ways they aren t even thinking of yet. Leverage our knowledge of the SMB marketplace. Realize new revenue streams from existing customers. Deliver a proven catalog of applications. Take advantage of our buying power to maximize margins. Easily add private and third-party apps into easy-to-bundle solutions. Choose from a variety of sales and service models. Centrally manage multiple sales channels. Get a complete solution: From deployment and training to dedicated account management and customer support. Create compelling bundled offerings that meet specific SMB needs. Build or Buy? It s only a matter of time. In addition to the millions of dollars in upfront investment required to create your own software marketplace, not to mention the ongoing costs of maintaining a viable system, the true opportunity costs come in the time it takes to deploy the solution properly. 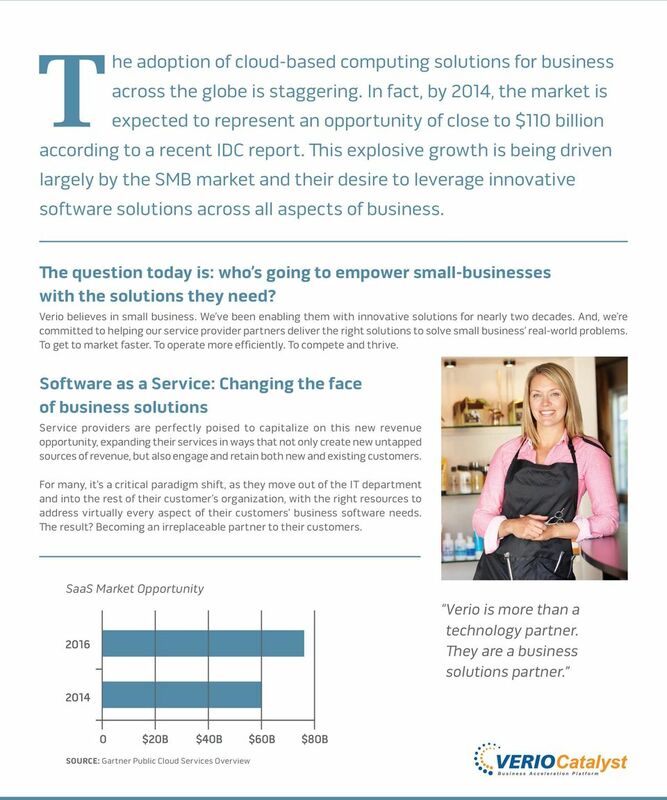 The SaaS market is developing now, with SMB customers actively looking for tools for their business. No one but Verio offers you the easy-to-deploy solution to solve their problems. Today. 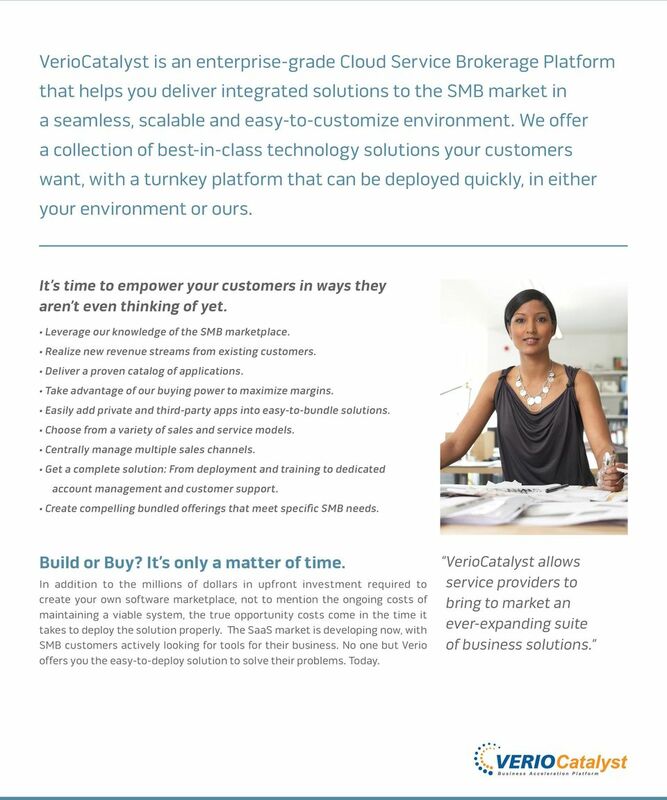 VerioCatalyst allows service providers to bring to market an ever-expanding suite of business solutions. 5 need help getting launched? We re here for you. Having an expanded catalog of offerings and compelling bundled solutions for SMBs is a wonderful thing. But we understand that transforming your business doesn t happen overnight. 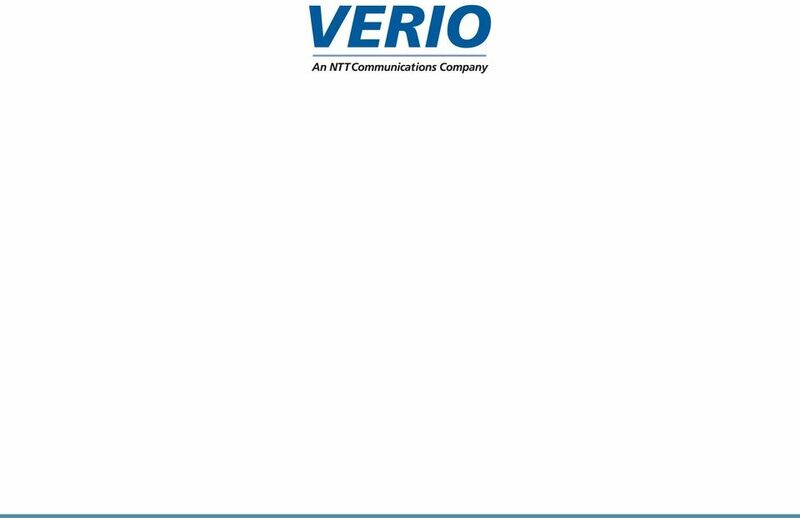 Verio can help you throughout the deployment as well as on an ongoing basis, by providing robust sales assistance and support services on your behalf. We have over a decade of experience helping our global partners take innovative solutions to market often doing so for them under their own brands. Tier-2 support to our partners internal team comes standard. We also provide experienced care teams for every product in our catalog. And, our optional branded sales assistance and support services are there if you need them: short-term while your teams get up to speed, or for the duration. 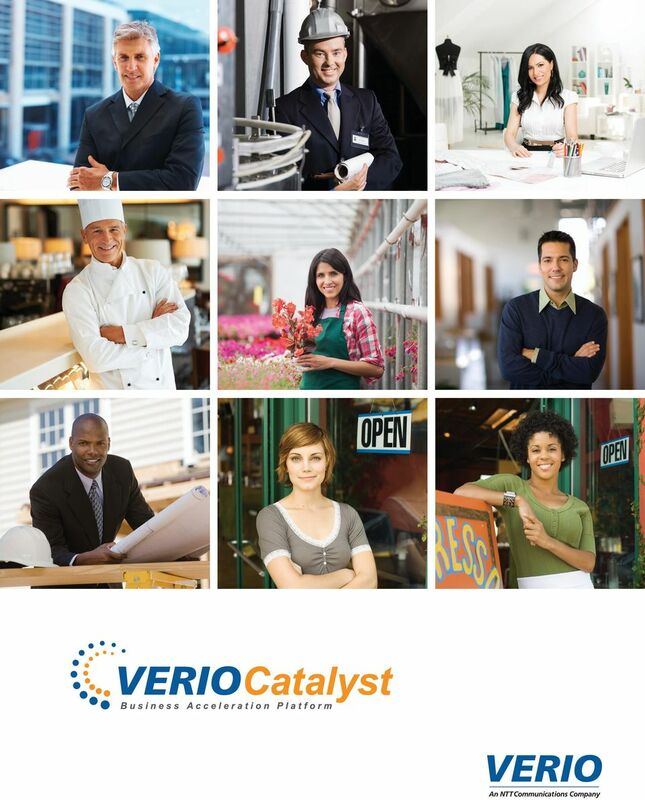 With VerioCatalyst, you can: Launch new products quickly Offer bundled solutions and promotions to your customers Be prepared to respond to market demands in days, not months Bill for products hosted by multiple, disparate systems Verio: Your trusted partner For nearly two decades, Verio has been a reliable channel partner, delivering innovative solutions to the SMB marketplace. We are a division of Tokyo-based NTT, the largest telecom company in the world, with a network of over 120 global data centers, a global Tier-1 backbone, and the resources of a Fortune Global 50 parent company. 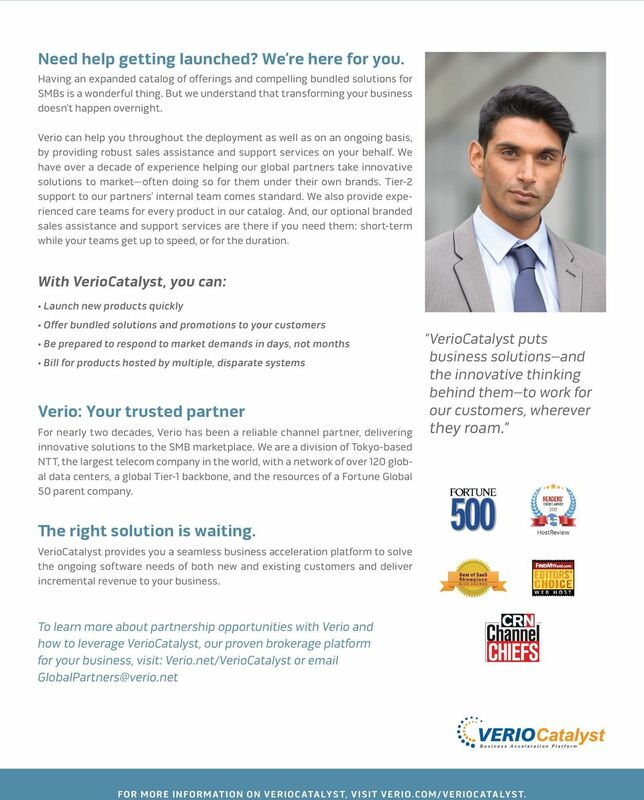 VerioCatalyst puts business solutions and the innovative thinking behind them to work for our customers, wherever they roam. The right solution is waiting. VerioCatalyst provides you a seamless business acceleration platform to solve the ongoing software needs of both new and existing customers and deliver incremental revenue to your business. To learn more about partnership opportunities with Verio and how to leverage VerioCatalyst, our proven brokerage platform for your business, visit: Verio.net/VerioCatalyst or for More InforMaTIon on VerIoCaTalYST, VISIT VerIo.CoM/VerIoCaTalYST. W H I T E P A P E R C l o u d E n a b l i n g P l a t f o r m s f o r S e r v i c e P r o v i d e r s, U p d a t e ( 0 4. 1 2. Infrastructure Services the way we see it Cover Next-Gen title Cloud: Helvetica Choice thin, and 30-33 maximum Control through 2 lines Cloud Service Brokering Cloud 2.0 is about more than cost savings. Feature Guide Elastic Path Subscriptions. 1.800.942.5282 (toll-free within North America) +1.604.408.8078 (outside North America) www.elasticpath. Showcase products, drive e-commerce and enable employees with mobile apps. Verio makes it easy. Private Label Web Services You can start offering and profiting from Verio s industry leading solutions in as few as 30 days. Accenture Cloud Platform Unlocks Agility and Control 2 Accenture Cloud Platform Unlocks Agility and Control The Accenture Cloud Platform is at the heart of today s leading-edge, enterprise cloud solutions. solutions WORKFORCE MANAGEMENT SUITE For Small and Midsize Businesses Enterprise-Class Workforce Management. Simplified. UNIFIED WORKFORCE MANAGEMENT: One database. One user experience. One employee record. Few decisions are taken today without the support of IT. It has become the lifeline of business and many private activities and processes. WEB2.